HomeVMwareESXi 4Boot ESX 4 from SAN on a failover LUN – Lessons learned. 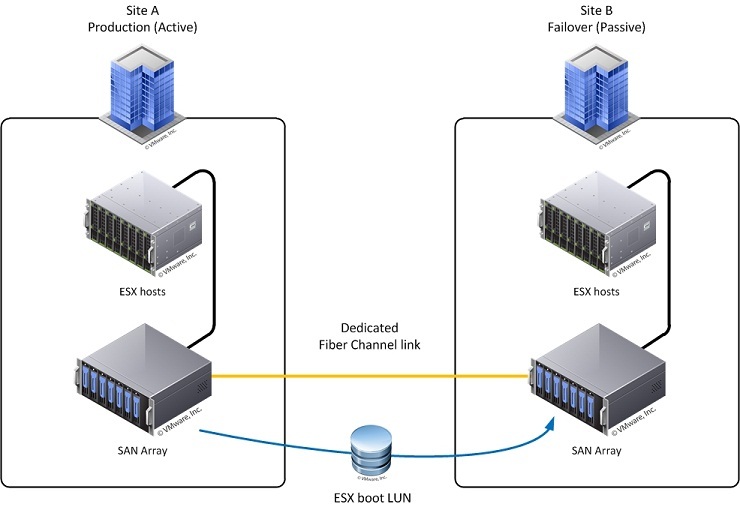 Boot ESX 4 from SAN on a failover LUN – Lessons learned. Make a note of this output. You will need it later. Wait until the host boots up and you see the GRUB menu. Highlight the “VMware ESX 4.0” and press the “e” button. Press Enter to accept the changes and press the “b” button to start the boot process. The ESX host should start successfully. Press Enter key to save the changes to the esx.conf file. Repeat step 1 to 18 for every ESX host. OK, the ESX part is done. The hosts should boot without any problems. Now, let’s try to bring the vCenter Server VM up and running. Login to one of the ESX hosts with the vSphere Client. Locate the vCenter Server on the datastore (if the datastore appears as a snapshot, simply rename it to the correct name). Add the vCenter Server VM to the inventory (if the vCenter Server has multiple disk drives located at different datastores, remove and re-add the disks to the vCenter Server VM). Check if the Network Adapter of the VM is connected to the correct network. Buy SRM! Or configure an Active/Active infrastructure. Can you please update the article if this happened on a ESXi host? Glad this blog post was useful to you. After the operation, the ESX boot LUN name in Vcenter has changed. It’s snap-xxxxxxxx- (in Configuration-Storage-Identification). As far as I can tell, everything else is normal. Is it really a snap shot? How can I tell? Or is it just a leftover from the earlier problem? In case of a LUN that has been replicated to another SAN, this is a normal behavior in vSphere 4.x, because there was a change to the disk or change to the controller connecting to the disk in which ESX(i) 4.x was previously installed. That’s why the disk is presented as a snapshot. You could resignature the disk and rename it but you will have to repeat the whole procedure as described in the blog post.